From the time Santanu having classes and top of it exams this month; its really a grueling month for both of us. For this I too was not getting some time off from “Our little one”. There was absolute need of one break. Santanu suddenly said two days before last exam that he is having leave and if interested then we can go somewhere near by. Then he only started reading on net and ended up saying we would go to WAYANAD- Northern region of Kerala. Word of mouth were the major sources of procuring information for undertaking the trip. Being at Bangalore, Wayanad was a good option since it was only about a 275 KM drive away. Earlier he said he will go via Nagarhole forest and return via Bandipur forest. My major concern was about our stay. As with Aarush if we don't look for proper place then journey is not peaceful. We looked for two homestays one near Nagarhole and other near Sultan Bethary. Looking does not means that we will stay there but then also we sincerely jotted them in MS- word with phone no. and all. I wanted to be sure where I am spending night otherwise I am not going anywhere. At that time he said we will do night stay at Mysore and then early morning we will leave for Wayanad. So took down hotel contact details and address of frill-free Ginger hotel of Mysore. Since that weekend was long weekend and Saturday was Santanu's exam I was not sure when exactly he wanted to leave from home. Because by the time he will reach home after exam it would be late afternoon. Then also on Friday late evening we packed our things with 'just in case thought.' On Saturday he called me up around noon saying to call those home-stays if there is any availability or not and to be ready otherwise to leave immediately within 1 hr. after he returns home. When I called those home-stays only one was available. Gave a call directly to her for availability otherwise pricing will vary then. Thereafter I remembered its not home-stays we are supposed to stay that night but frill free hotel of Mysore. Later after his exams I called him to clarify those doubts and that time he said no we are going straight to one which is available at Wayanad. I was bit stupefied on hearing that - Was really not sure whether he would be able to drive that evening or not but he sounded quite confirmed in his answer. Oh man! he is so adamant not to make any proper itinerary before any trip. Finally, route was Bangalore - Mysore - Nanjangud - Gundalpet - Sultan Bathery – Wayanad. We set off on Saturday at 4.10 PM from home and touched Mysore by 7.15PM since it was already dark we missed the signal of Ooty and ended up going to Mysore palace. 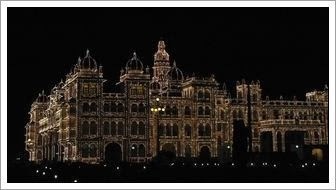 Luckily, from far we saw whole palace being lighted up. So we made a halt to take photographs. Some open air music function was going on at eve of Ugadi. Around 7.50PM we happened to ask one police-officer the route to Ooty and he was startled seeing me and Aarush saying its too late to go there. Will take around 9-10 hrs to reach and road is not that excellent. 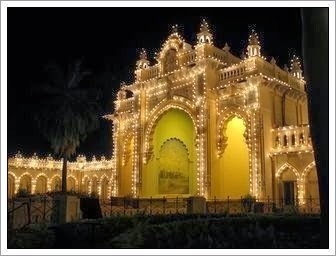 And suggested to stay at some hotel at Mysore only. Then we said we actually want to go to Wayanad. Hearing that he seemed to be quite relieved and said road is very good and gave direction to the same. By 8.05 we were in car and in no time were at route leading to Nanjangud. Our excitement was in the air. The route to Wayanad had to be traversed through the hilly terrain highway. We could not speed up much although Aarush was sleeping but dazzling lights from opposite direction vehicles were very disturbing. We made few more stop - overs to confirm the route and then take-away dinner on route. Crossed dense jungle of Bandipur at night. We had to be very vigilant through out. As this was our first night drive. There are lots of check posts and in one check post Santanu had to get down to give driving license and car registration details. Lady of home-stay – 'Ente vedu' told me once you reach Sultan Bathry give call for further directions. Route to our home-stay was another 45 min. more from S.Bethary. We had to leave NH 212 and drive on a connecting road towards Mananthavady this road was complete dark and up-down roads with lot of winding we were not able to accelerate more. As it crosses villages there were no car or person on the road. Still we found some night owl to confirm we are on the right direction or not. Her guide "Nash Jose" directed us although we were feeling quite uncomfortable for disturbing them that late. Guidance was with location, buildings on the road sides and also with distance from where we were calling. Later from one point we were not able to figure out which route to take then he came himself to that point to guide us. Really nice of him. This home-stay is located in Panamaram, Wayanad. In spite of reaching the homestay pretty late (past midnight) he showed us room and other facilities and bid goodnight. That night we were given one big room (kind of dormitory where many can stay together with bathroom but toilet was outside. Thank God we did not need to share with anybody. As all other rooms were booked we got this one and we were told by morning we can change to room of our choice. The name Wayanad comes from 'Vayal' and 'Nadu' which means the land of paddy fields. It's really rich in nature with all those rolling hills and tropical rainforests. Edakkal caves are great too. Wonderful stuff.. I like traveling that is why I stayed in many hotels. I like your shared hotel. I want to share one more Hotel In Ajmer.